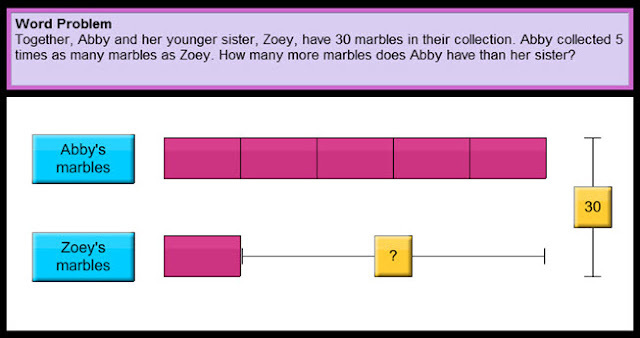 Thinking Blocks is an online problem solving tool that enables students to build physical models of math word problems. Using brightly colored blocks, students represent mathematical relationships and identify known and unknown quantities. The model provides students with a powerful image that organizes information and simplifies the problem solving process. By modeling increasingly complex word problems, students develop strong reasoning skills which will facilitate the transition from arithmetic to algebra. Thinking Blocks programs include word problems involving addition and subtraction, multiplication and division, fractions, and ratio and proportion. Within each of the four main modules, there are both simple and multi-step word problems for students to solve. These problem sets refer to generalized visual models that can be applied to a variety of scenarios. While results are not stored from session to session, each student's progress can be monitored during a single practice period. Thinking Blocks supports many of the common core state standards for mathematics, particularly those found in grades 1 through 6. The standards described below come directly from the Common Core website. 1.0A.1: Use addition and subtraction within 20 to solve word problems involving situations of adding to, taking from, putting together, taking apart, and comparing, with unknowns in all positions, e.g., by using objects, drawings, and equations with a symbol for the unknown number to represent the problem. 1.0A.2: Solve word problems that call for addition of three whole numbers whose sum is less than or equal to 20, e.g., by using objects, drawings, and equations with a symbol for the unknown number to represent the problem. 2.0A.1: Use addition and subtraction within 100 to solve one- and two-step word problems involving situations of adding to, taking from, putting together, taking apart, and comparing, with unknowns in all positions, e.g., by using drawings and equations with a symbol for the unknown number to represent the problem. 3.0A.1: Use multiplication and division within 100 to solve word problems in situations involving equal groups, arrays, and measurement quantities, e.g., by using drawings and equations with a symbol for the unknown number to represent the problem. 3.0A.8: Solve two-step word problems using the four operations. Represent these problems using equations with a letter standing for the unknown quantity. Assess the reasonableness of answers using mental computation and estimation strategies including rounding. 4.0A.3: Solve multi-step word problems posed with whole numbers and having whole-number answers using the four operations, including problems in which remainders must be interpreted. Represent these problems using equations with a letter standing for the unknown quantity. Assess the reasonableness of answers using mental computation and estimation strategies including rounding. 4.NF.3: Solve word problems involving addition and subtraction of fractions referring to the same whole and having like denominators, e.g., by using visual fraction models and equations to represent the problem. 4.NF.4: Solve word problems involving multiplication of a fraction by a whole number, e.g., by using visual fraction models and equations to represent the problem. 5.NF.2: Solve word problems involving addition and subtraction of fractions referring to the same whole, including cases of unlike denominators, e.g., by using visual fraction models or equations to represent the problem. Use benchmark fractions and number sense of fractions to estimate mentally and assess the reasonableness of answers. For example, recognize an incorrect result 2/5 + 1/2 = 3/7, by observing that 3/7 < 1/2. 5.NF.7: Solve real world problems involving division of unit fractions by non-zero whole numbers and division of whole numbers by unit fractions, e.g., by using visual fraction models and equations to represent the problem. For example, how much chocolate will each person get if 3 people share 1/2 lb of chocolate equally? How many 1/3-cup servings are in 2 cups of raisins?